Florida State is a red hot basketball team after winning five straight contests. 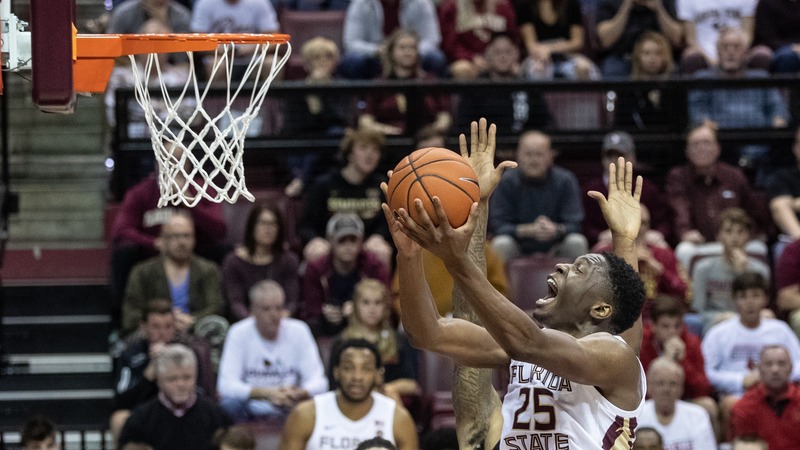 The Seminoles made a statement over the weekend with a thrilling 80-75 home victory over Louisville after handling Syracuse at the Carrier Dome earlier in the week. For the season, FSU sits at 18-5 and 6-4 in ACC play. In this week’s slate of bracket projections that we examined, all experts had the Seminoles currently pegged as a No. 6 seed. Both NBC Sports’ Dave Ommen and the USA Today tandem of Scott Gleeson and Shelby Mast have the Seminoles facing No. 11 seed Seton Hall in the South Region. The only difference is the location as Ommen puts the teams in Hartford while USA Today puts the teams in Tulsa. FSU is 3-1 all-time against the Pirates and 2-0 on neutral courts, but Seton Hall won the last meeting in Tallahassee in 1999, 79-56. ESPN’s Joe Lunardi and SB Nation’s Chris Dobbertean both put FSU in the East Region in Hartford, but against different opponents. Dobbertean, who has the most updated bracket projection, pits the Seminoles against Minnesota. FSU is 5-6 all-time against the Golden Gophers with six of those match-ups coming in the ACC/Big Ten Challenge. FSU won the last match-up in Tallahassee in November of 2016, 75-67. FSU defeated Minnesota in the 1972 Sweet 16 en route to the Seminoles’ only Final Four appearance. Lunardi has FSU facing Marquette. The teams are 2-2 all-time against one another. FSU won a thriller in the 2009 Old Spice Classic championship, 57-56. CBS Sports’ Jerry Palm has the Seminoles facing Oklahoma in the West Region out in San Jose. FSU is 0-2 all-time against Oklahoma on the hardwood, but the teams have not met since December 1987. Florida State will play games this week against Wake Forest on Wednesday night and Georgia Tech on Saturday. With losing records, neither of those teams appear in any bracket.